Yellow-rumped (Myrtle) Warbler perched on a branch. 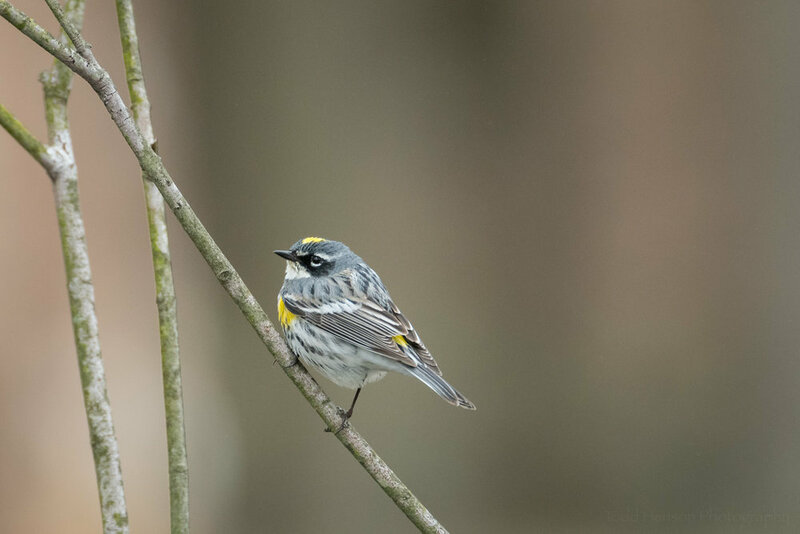 On a recent trip to a wetlands park I was fortunate to watch and photograph several Yellow-rumped Warblers of the Myrtle variety. These are a beautiful bird with a yellow patch on their rump, the top of their head, and on their sides. Their back is grey, and the rest of their body is white with black patches and stripes. Side and underside of a Yellow-rumped (Myrtle) Warbler in the brush. I worked to create photographs of these warblers from every angle I could, trying to capture images of their identifying characteristics. This makes it easier to identify the species from field guides. Yellow-rumped (Myrtle) Warbler facing forward and singing. Yellow-rumped (Myrtle) Warbler facing forward, head facing the left. I also worked to create as many pleasing images as I could. In one location I noticed how the warbler would return over and over again to the same set of perches. I found a perspective to shoot this location that gave me a nice, simple, out of focus background. Then I just watched and waited. I readied my camera when the warbler appeared to be returning to the perches I’d seen it use before. And then I began photographing, hoping to capture some nice gestures, some pleasant angles. Side view of a Yellow-rumped (Myrtle) Warbler perched in the brush. There is skill in photographing wildlife. Some of that skill is learning the behavior of the animal, learning its patterns and anticipating what it might do next. Some of the skill is knowing your gear, getting it setup and ready. Yellow-rumped (Myrtle) Warbler perched on a tree, head looking down towards the ground. But there is also luck in photographing wildlife. You can’t control the animal. It will do what it wants. Luck will play a part in whether you see the gestures you might wish for. Luck will play a part in whether the animal actually does return to the same spot or whether it decides to move on to another location. 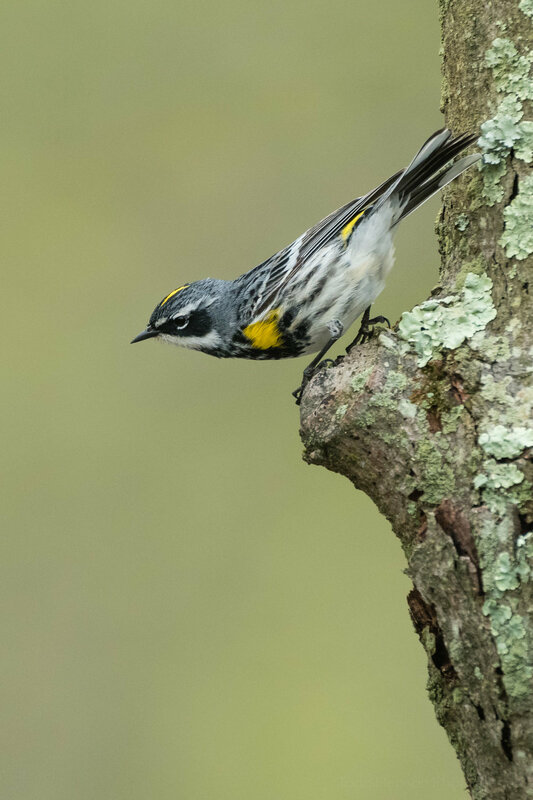 Profile of a Yellow-rumped (Myrtle) Warbler perched on a branch. Finally, patience plays a huge part in photographing wildlife. The animal may very well return to the same location, but it might not do so right away. You may have to wait many minutes, or in some cases hours for the animal to return. It may not return at all that day. You may need to try again another day, over and over again, watching and waiting, but never giving up. Yellow-rumped (Myrtle) Warbler perched on a tree, getting ready to fly. 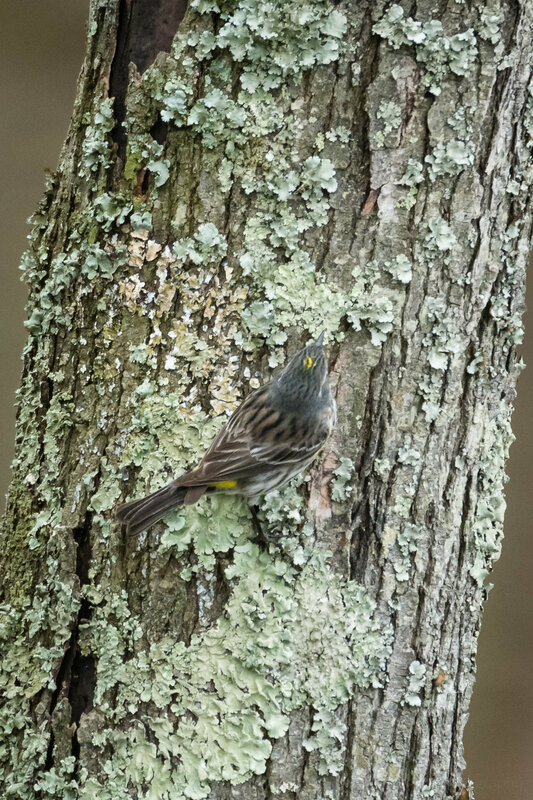 A top down view of a Yellow-rumped (Myrtle) Warbler on the side of a tree. But photographing wildlife is worth it. You get to spend some small part of your day out in nature watching, learning about, and creating images of all these beautiful creatures. It doesn't get much better than that!